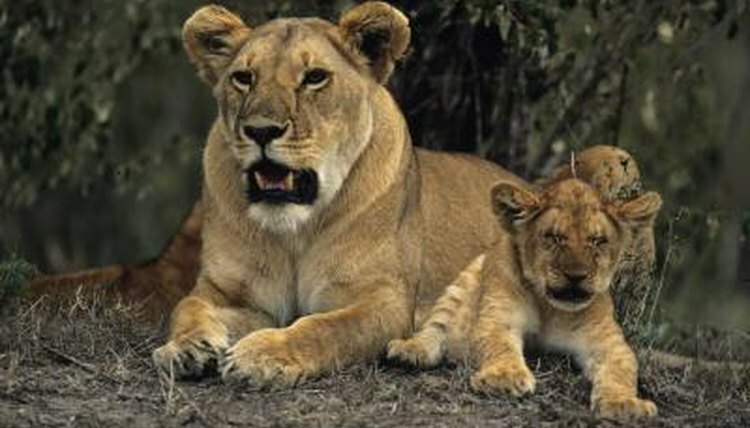 From fertilization to birth of lion cubs generally takes 110 days. A lioness attains only half the size of her male counterpart and she does most of the hunting. She gives birth to a litter of cubs, usually two to four, and protects them in the early stages of their lives. Like kittens, lion cubs come into the world with their eyes closed and are helpless at birth. Lions live in groups called prides. Living in a group gives them opportunities to mate and raise their young in greater safety than if lions roamed alone or in couples. Although a lioness goes off to a den away from the group to give birth, the females of a pride generally have their cubs at about the same time and raise them together, even nursing each other's offspring. Only one out of eight cubs will live to become an adult, Jim Thompson reports in his book, "Lions." A lioness generally gives birth every two years. She takes care of her cubs, moving them to different dens to protect them from predators for the first weeks of their lives. When the cubs become independent, she mates again. Lions may mate in captivity. If the mating succeeds in fertilization, the gestation period is the same as in the wild, about 110 days. Lion cubs have dark spots and some keep their spots into adulthood.